Within the Savannah National Historic Landmark District, the existing Burger King store did not match the distinctive grid plan and architecture of its surroundings. Our team re-designed the store to match the surrounding aesthetics. To meet the re-design goals, Raymond Engineering worked with a “blank slate”; the original Burger King store was demolished to the foundation, and on-site utilities were removed. Raymond Engineering started the re-design using the customer-provided prototypical plans for their franchise locations. 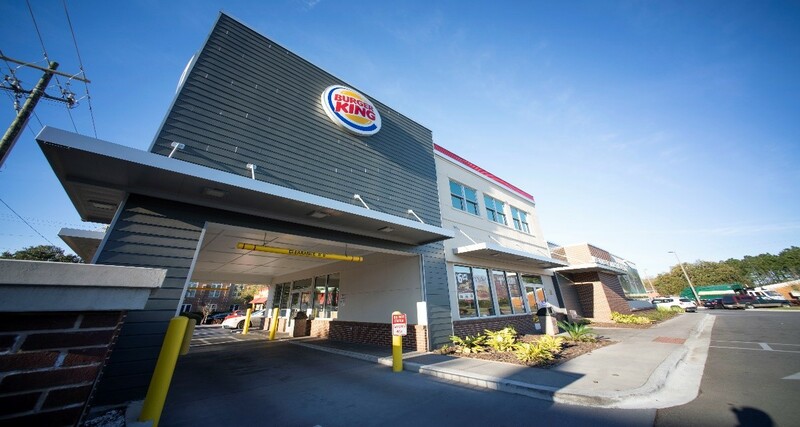 Burger King locations are typically 1-story buildings; however, this location would have a 2- false façade designed to create the illusion of a 2-story building to match the surrounding aesthetics. The interior of the building maintained the traditional Burger King features and aesthetics, while the drive-through was moved to the front of the building for safety reasons. Once the design process was completed, our designs had to be approved by the Historic Review Board. Raymond Engineering attended 2 public Historical Review Board meetings to facilitate the approval process.